The Brooks World Poverty Institute at the University of Manchester recently released a working paper titled “The Role of NGOs and Civil Society in Development and Poverty Reduction”, which discusses the shift in NGOs from their original people-centered approaches to development to more donor-dictated responses to poverty. The release of this paper has been cited in a recent Guardian article and has also sparked much debate among the NGO community. Since the document is long, I will first summarize it, then I will discuss the debate that has emerged from the aid community (mostly through Duncan Green’s Oxfam blog), and then give my opinion of the paper based on my status as a student/academic and someone aspiring to work in NGOs. The authors, Nicola Banks and David Hulme, begin their working paper by describing the origins and history of NGO work, albeit short and generalized. They argue that NGOs emerged onto the development scene in the late 1970s, and since then, their numbers have grown exponentially. They argue that between 1992 and 2002 the number of INGOs grew by 19.3% (Hulme and Banks, 4). Banks and Hulme state that NGOs started in development by emphasizing service delivery and advocacy. However, ever since the rapid proliferation in the number of NGOs and the subsequent increased competition over limited donor funds, NGOs have since shifted their attention from service delivery towards more donor-dictated responses to poverty, which they argue has become depoliticized. According to the authors, NGOs working in development and poverty reduction1 were first people-centered and focused on long-term civil society capacity building in hopes to foster “a stronger democratic culture in which changes are hypothesized to feed into local and national institutions and processes” (Hulme and Banks, 10). NGOs located themselves close to those whom they were meant to serve, thereby generating “bottom-up opportunities for development” (Hulme and Banks, 11) and allowing local communities to express their wants and needs. However, with the rapid increase in the number of international NGOs came the increased competition over limited donor funds, which has led to many NGOs to locate themselves closer to their donors, which further distances the NGOs from their “grassroots orientation”, “innovativeness”, “autonomy”, and those they are meant to serve and represent – or in Hulme and Banks’ own words, “[NGOs’] unequal position in the international aid chain means that NGOs have become too close to the powerful, and too far from the powerless” (Hulme and Banks, 12). Hulme and Banks’ argue that NGOs are highly dependent on donor funds, which sometimes makes up 85-90% of their income, which can compromise their ‘independence’ since donors are sometimes able to decide which countries/populations/crises that funds go towards, thereby resulting in the “‘donor-darling’/’donor-orphan’ divide” and contributing “to uneven patterns of development” (Hulme and Banks, 15). In order to satisfy donors, NGOs have shift away from their original long-term oriented development approach to a more short-term approach, which is measured in set timetables and has measureable outputs so that donors are kept satisfied. The authors argue that NGOs began as representatives of civil society and therefore were somewhat political actors. However, in the past few decades, NGOs have emphasized the NG in their acronym (non-governmental) and reaffirmed their apolitical stance, which allows them to operate in areas they would not be allowed to otherwise. This separation between NGOs and governments has, however, depoliticized poverty, making it seem more as the disease plaguing society rather than a symptom of a deeper embedded systemic problem. By deepening the dichotomy between governments and NGOs, tensions have formed between the two which often prevents collaboration. The authors state the that depoliticization of NGOs has caused a shift from ‘little-d’ development, which was achieved through working alongside social movements and grassroots advocacy groups, to ‘big-D’ development which is measured by project creation and measurable data. 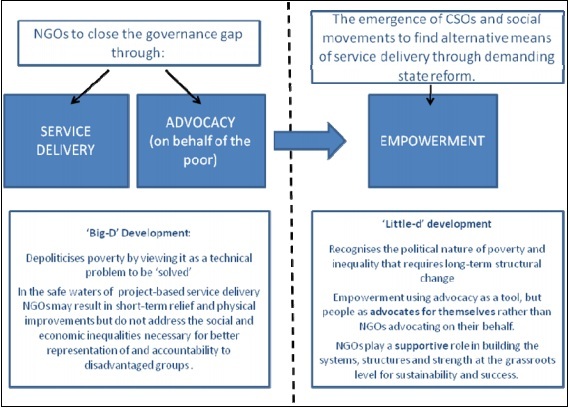 Hulme and Banks argue that NGOs need to realign their focus and revert back to their original grassroots orientation and focus on ‘little-d’ development which is not centered on poverty reduction (which treats poverty as something separate from the political condition), but rather towards supporting civil society (through social movements and advocacy) to challenge political and social inequality. This (re)politicization of NGOs seems almost paradox to what we know them as today because (political) independence is so often emphasized. 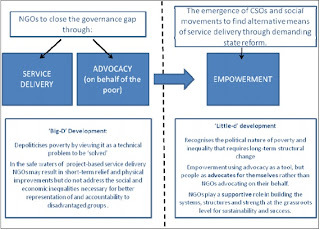 However, if NGOs working in the poverty-reduction/development sector wish to truly combat the causes of poverty, work towards sustainable development, and rebalance the currently unequal power relations in societies where poverty exists, then Hulme and Banks argue that NGOs need to shift from being supply-oriented to more demand-oriented, which then makes NGOs once again “bonded and accountable to [the] civil society” they are meant to serve and represent (Hulme and Banks, 24). This paper has sparked a heated debate among the NGO community, particularly on Duncan Green’s blog, From Poverty to Power. Green stated in his irritated and heated blog post that he does not so much have issues with the content and conclusions of the paper, but rather with the authors’ methodology, since it contains no literature from NGOs, and because it contains many generalizations. I respect Green’s blog and his opinions, and I agree that this working paper does have its faults. Yes, the literature used throughout this paper is biased. It contains, what I would consider, a substantial amount of sources for a 30 page paper, but it does lack evidence, interviews, and literature from NGOs themselves, which would make for a more balanced and credit-worthy piece. However, this is a working paper (which Green seems to consider an excuse used by the authors for their inadequate research), which means that this paper is not yet finalized and has room for improvements. Perhaps now the authors will realize their bias in their paper and delve deeper into research for evidence from NGOs, which might either strengthen their argument or perhaps strengthen their counter argument, which is pretty absent in the paper from what I can tell. As a student and academic, I know how tiring and endless research can be. I for one was impressed by their bibliography (although I do believe they could have consulted some NGO publications). But there are only so many minutes in an hour and hours in a day. Sure, they could read and incorporate all literature ever published on the topic from both sides, but that would take years, and by then the debate will have changed. It’s better to publish now, get critiques and opinions, spark a debate, and revise so that their argument can be strengthened and be more useful in the debate on aid improvement. Instead of hurriedly and heatedly criticizing the authors and the paper, Green should have taken the time to do research himself. Instead of merely ripping apart the paper (which students know is not a constructive form of criticism), Green should have instead suggested areas of improvement and suggested literature from NGOs that serve as decent counter evidence to the paper's thesis. If Green says that the paper generalizes, then give proof! Find publications by NGOs that say otherwise. One cannot be a good debate participant by simply trying to legitimize the other side’s argument. Instead, provide counter evidence and support for your own argument so that the debate is actually constructive. Green’s argument about the generalizations used in the paper is correct. Hulme and Banks used the term ‘NGO’ very broadly to get their point across, which is dangerous for those not knowing that there are immense differences between various NGOs and that not all NGOs are created equal. However, unless Hulme and Banks were anticipating their paper to be a 300-page dissertation, then generalizations are inevitable. With the hundreds of thousands of NGOs out there all working in different sectors, there is really no choice but to generalize. Sure, the authors could be a bit more explicit and forward that their use of the term ‘NGO’ is being used in its broadest sense. But besides that, I really don’t think the authors had much choice but to make generalizations unless they chose to analyze a specific sector/specific NGOs, which might not have sparked such a debate as their current paper has. First off, the authors never state that every NGO is alike and that they all are either professionalizing (which is not necessarily a bad thing in my opinion) or ignorant to the fact that they aren’t successful. Perhaps the authors were trying to give their readers the benefit of the doubt and assuming that those reading this piece are intelligent enough to know that every NGO is different and not all are self-serving or ineffective. The point I think that the authors were trying to make, although general and perhaps done in a slightly sloppy manner, is that NGOs need to be careful when they professionalize so that they do not sacrifice their original goals in order to satisfy donors. Also, as I’m sure Green realizes, there are NGOs out there who are not successful in what they do, but the authors are not saying all NGOs are like that. Sure, the paper generalizes and by doing so it fails to recognize that there are NGOs out there that are smaller, grassroots-orientated and effective in helping their target population with little donor-interference. There are also large international NGOs out there that, despite their heavy dependence on donor funds, are still independent and effective in what they set out to do. But I think that by generalizing, the authors mean it to more serve as a warning that in the increasingly professionalized field of aid, the quest for funds should not interfere with original objectives. I think it also serves to warn that if NGOs cannot be relatively self-sufficient and independent, then perhaps it is best they do not survive, because chances are there is another more efficient, sustainable, and effective NGO out there doing the same thing. [This paper] makes me rather worry what our students are being fed (but at least explains why several have come up to me after talks to say how confused they are because they like what I’ve said, yet have been previously taught that all NGOs are evil/incompetent pawns of imperialism). As a student who is graduating this year and hoping to enter the NGO/aid industry, this comment is a bit…extreme in my opinion. Granted, I’m studying in the U.S. while this paper was published in the UK, but I highly doubt that our educational content is all that different. I have taken classes studying NGO work and humanitarian aid, and never have I been told that all NGOs are evil or incompetent. Nor have I been told that they are forms of neo-imperialism. In fact, I have never even been told that one NGO is evil or incompetent. My professors all have the greatest respect for NGOs and development work, and some of my professors have worked in both small and large NGOs. So for your information, Mr. Green, we (students) are being taught to evaluate, analyze, and critique the activities and current situation of NGOs, but we are never told that they are neo-imperial or evil. Please give our intelligence the benefit of the doubt - we know that NGOs are not out there as “pawns for imperialism”, but we are taught to critique and analyze the world around us, so if we see areas for improvement, we will say so. I think a healthy dose of self-criticism is necessary for NGO work to improve, evolve, and become more effective. I think it is safe to say that we don’t want NGO work to remain stagnant. The world is changing, conflicts are changing, and causes of poverty are changing - so the approaches used by NGOs should change as well. I would be more worried if we students were instead being taught that the system is perfect the way it is and we should mindlessly follow the examples already set for us. We are new generation of NGO workers coming up. If we are to respond to the challenges that we will face tomorrow, then we need to be self-criticizing and analyze how aid has evolved over the past several decades and evaluate whether or not the changes made have benefited those that NGOs are meant to help. Personally, as both an academic and as an aspiring aid worker, I think this paper does a nice job at critiquing the industry, despite the fact its arguments have been stated before and it falls victim to gross generalizations. Regardless of this, I think this paper would be useful for students who want to work in NGOs to read so that they can critique and analyze the current NGO environment. By doing this we can suggest areas of improvement in order to make aid more sustainable, recipient-oriented, and geared towards addressing the systemic problems that create poverty and underdevelopment. Because if we continue to just battle merely the effects of poverty rather than its roots, then the world 50-100 years from now will be the same, if not worse, than the world we live in today. 1 The authors simply use ‘NGO’ in its broadest sense. There are many types of NGOs, from development NGOs to emergency relief NGOs. Humanitarian emergency NGOs, in my opinion, are meant to focus on short-term goals in alleviating immediate suffering. Development NGOs, however, need to focus more on long-term goals, sustainability, and changing systemic problems that create poverty and underdevelopment. The authors do not specify the specific sector of NGOs it is critiquing, but from the title “The Role of NGOs and Civil Society in Development and Poverty Reduction”, I assume that they are talking about development NGOs rather than emergency response NGOs. Nice writing, this is very insightful. I rarely hear from the other side. You see, my fiancée was recently in Peace Corps in Ghana, and her & every PC volunteer I've met are -very- critical of NGOs. Myself, I like the sound of 'little-d'. You might want to, if you haven't already, talk to some Peace Corps volunteers/veterans about the efficacy of most NGOs. I wouldn't generalize so much but I can see how their experiences are very different from NGO workers, and could provide some insight. Maybe you all could do the same for them.